A while back, CSN Stores contacted me to do a review for them, remember my sneak peak here? Well, I had originally chosen 3 items to have you help me pick from? Well, I had chosen #1, the Hammock chair, but sadly, come to find out, it was out of stock, for a while. So the more practical side of me suggested to keep looking around through their huge store sections of furniture, dinnerware, decorations, lighting, bedding, cribs, kids beds and toys and find something we could really use for the home. 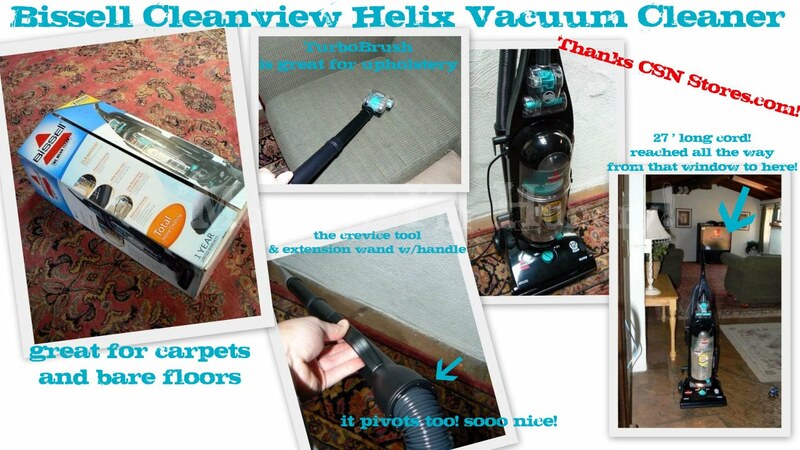 So this new Bissell Cleanview Helix Vacuum Cleaner vacuum it was! Ironically just recently I literally threw our old one out the door because it wasn't doing any good. Sweeping carpet is NO fun (and we have a huge rug), so I was excited to get this. It was in stock, so once my PR Rep. ordered it for us, it was at my door in 3 days!! Very fast shipping and reliable tracking (UPS), and their shipping is free on most of their items too!! So I didn't get my hammock chair to relax in, but my lovely Sister in Law did give us her ice cream/yogurt maker (#2 on my list there) so I'll at least get to enjoy some of that after cleaning! lol. This vacuum is great, I've always had the ones with the bag, so I'm happy I finally have a bagless vacuum. I love the attachments too, the upholstery one is pretty cool. Once it's stuck on the nozzle it "vroooms" away and does a great job, getting under the cushions cleaned. We have flagstone flooring throughout our entire house (except the 3 playrooms -ok my "office" & Mr.'s "office" & the kid's toy room- have a plush carpet), and I have large area rugs all around too. This vacuum did a superb job on the rugs and bare floor. Click on my photo collage to read my captions. I enjoyed shopping at CSN Stores, their selections are great, and with so many departments to choose from! Their shipping is outstanding, and have great Rep. representing them. Thank you so much CSN Stores for allowing us to review you! I wrote this review for "Mommy? I'm Hungry!" about CSN Stores. I received free product from CSN Stores to keep for this review. All opinions for this review are that of myself & family. Product info & stock images provided by csn store's site & online. I've heard this is a really nice vacuum. Hmm, may be time to hit up CSN stores to see what deals they have going on.